Air India will operate 4 flights a week between Delhi and Moscow’s Domodedovo Airport. Air India, India’s national carrier, said it is resuming flights to Moscow with services to the Russian capital to commence on July 18. The airline will fly from New Delhi to the Domodedovo airport on Monday, Wednesday, Friday and Saturday. The flight departs from the New Delhi at 1:55 am and lands in Moscow at 6:15 am, while the flight from the Russian capital departs at 8:20 am and arrives at the Indira Gandhi International Airport at 1:20 pm. 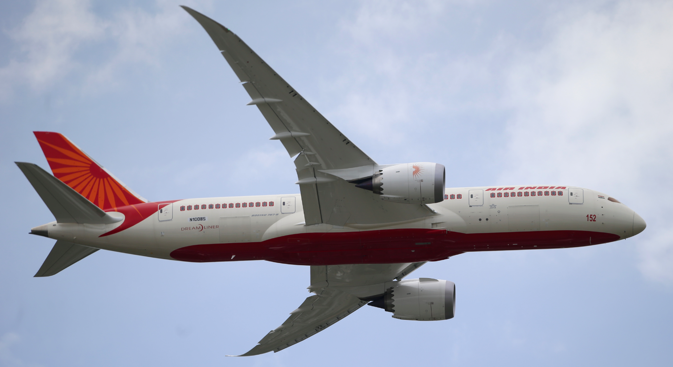 Air India said it would operate its new Boeing 787 dreamliner on the route. The aircraft can house up to 335 passengers. This increases the number of weekly connections between Moscow and New Delhi to 11, with Aeroflot operating a daily service between the Indian capital and Sheremetyevo airport. As per the existing India-Russia air services agreement signed in 2006, designated carriers from both countries are allowed to operate 46 flights a week in both directions. Russian airlines use this capacity in the tourist season for chartered flights to Goa and Kerala. India’s low-cost carriers have been seeking an entry to the Russian market and using Moscow as a base for flights to other cities in the Commonwealth of Independent States. Simplified visa procedures have led to an increase in Indian tourists visiting Russia. The number of Indian tourists that visited Russia in the first quarter of 2014 grew by 13 percent, according to official statistics from the Russian Federal Tourism Agency. There has also been a steady stream in the number of business visitors, according to sources in the Russian embassy in New Delhi. Travel agents also foresee a rise in Russian tourism to India once the visa-on-arrival system is put in place. It was announced last year that citizens of 180 countries would offered a visa at an Indian port or entry, but the latest Indian media reports indicate that the number will be 40, with Russian featuring in the list. The Association of Russian Tour Operators said earlier this year that a lot will depend on the validity of the visa on arrival. Now Russian tourists get a six-month visa with a possibility of two visits, and many use it for long vacations in Goa. The new visa will be valid for 30 days. However, with greater connectivity with Delhi, more Russian tourists may use the Indian capital as a base for trips to the Himalayas and Rajasthan.